Imagine communicating at dinner without uttering a single word. Students in the American Sign Language Club (ASL) often do just this, communicating only in ASL as they share a meal together. The ASL Club hosts silent dinners each week at places like Panera Bread, Starbucks and Star Ginger. Their events include Eye Worship and a gala at the end of the year. A new addition to the club is the American Sign Language Honor Society. 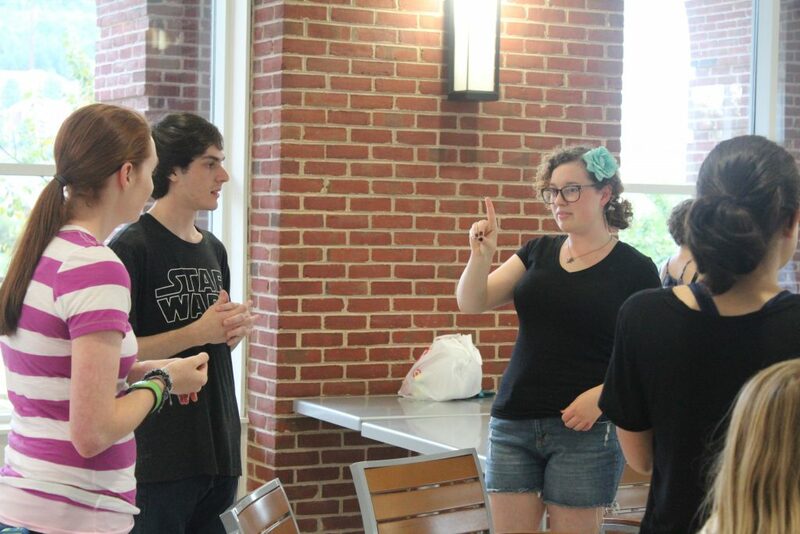 Liberty ASL Club’s purpose is to “better understand deaf culture by engaging in activities such as silent dinners.” The ASL Club offers an outlet for both deaf and hearing students to thrive in their college experiences. Vice President candidate of the ASL club Ana Horner began learning sign language in fifth grade. Horner developed a heart for ministry to the deaf not long after being introduced to the language. Now she is an ASL major, planning to work as a translator after graduation. ASL Club Treasurer Marianna Atwell has experience in the club as a deaf member. “My involvement with the ASL Club has enhanced my experience at LU because I get to know other people without the middleman (interpreter) and language barriers,” Atwell said. The ASL Club engages with the deaf community at Liberty, and strives to foster an environment of opportunity. The ASL club also has a strong support from the Deaf Ministries at Living Word Baptist Church in Forest. Horner explained that the club is open to all Liberty students. “The main goal of the club is to develop community and have a chance to use the language practically,” Horner said. ASL student Savannah Brangman shares a passion for ASL. Brangman encourages those interested in ASL to take a class. Brangman recently attend the ASL club’s silent dinner at Panera Bread. She said that though communicating pushed her out of her comfort zone, it was a great experience. The ASL club helps bridge the gap between the learning in the classroom and real life. Vice President Horner encourages anyone interested to come out to the events. For more information on Liberty University’s ASL Club, visit their Facebook page or speak with a member.